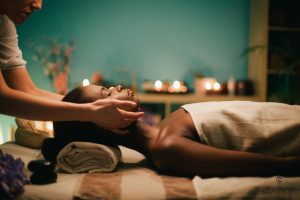 An Ayurvedic facial will leave you feeling more relaxed, energised and balanced, as well as tightening the skin, removing toxins and impurities and generally improving your overall well-being. OmVeda Signature treatments are formulated to detox, nourish and rejuvenate face, body and hair at all levels providing a complete mind, body and spirit experience. Totally natural treatments combining specific herbal blends for every skin conditions. Many of the treatments combine fresh raw ingredients like carrots, cucumber, potato, yoghurt, milk and honey to make fresh herbal pastes. The benefit of fresh ingredients combined with power of herbs rich in enzymes, vitamins and minerals results in naturally giving the skin and hair rejuvenation and marked improvement. Timeless in its skin refining benefits, it is absolute in body therapy and combines an uplifting massage, ex-foliation and mask or wrap that helps the skin regain its vitality, stimulates circulation improving the quality and texture of skin and the elimination of impurities. A spiritual and cultural symbol, the OmVeda concept of beauty and health surpasses all trends and is suitable for all ages. An excellent and rejuvenating experience, while helping to minimise expression lines, Pearl Ash is rich in calcium, valuable minerals and amino acids, to aid in strengthening the skin’s cell structure, speed up the skin’s metabolism, reducing redness, minimising pores and also helps to heal blemishes.